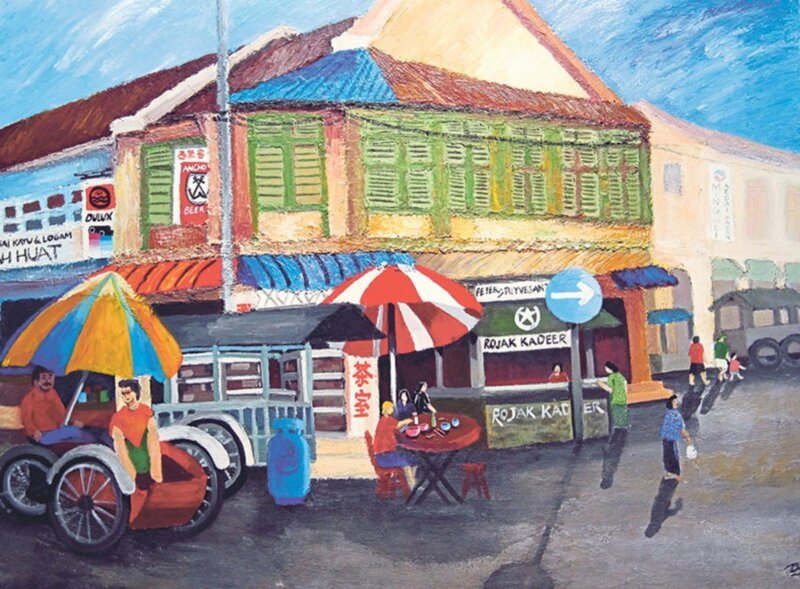 “Mummy, my teacher told me to go to Tanjung Rambutan (the nation’s oldest mental institution and now known as Hospital Bahagia, located in Perak). But I’m not crazy, mummy.” The words uttered to her by her son, Dennis Liew, more than 20 years ago when he was still in primary school continue to haunt Patricia Lim. Tears threatening to spill from her eyes, Patricia recalls that day with such clarity when we meet for our chat about her now grown-up son’s second solo art exhibition currently taking place at The Ledge Art Gallery in 1 Utama Shopping Centre, Petaling Jaya, Selangor, until Jan 1, 2018. Dennis, confides Patricia, was not like any other kids in his school. While other pupils thought he was mad, he was simply living in his own world inside his head. Nobody but his parents understood his condition. It all started when he was about a year old and suffered from a blood disorder which kept his parents busy going in and out of hospital for treatments for more than a year. Although they were sure that his condition was improving, they continued to monitor him closely, especially when they started receiving complaints from their son’s kindergarten teachers about his peculiar behaviour. According to them, he was too quiet and reclusive. When Dennis entered primary school, his behaviour changed again. His peers couldn’t understand why at times he behaved so wildly. The kids would call him all sorts of demeaning names: stupid, crazy and more. His parents began to get worried and decided to consult specialists and prepare for the worst. “Your son has Asperger’s Syndrome,” said one specialist, confirming the diagnosis. And just like that, the family’s world came crashing down. But Patricia and her husband knew that they had to be strong for their son. One of the first things they did upon learning of their son’s condition was to do as much research as they could. They trawled through tonnes of books and consulted specialists. Back then, there was no Internet so everything had to be done from scratch. Through their research, the couple discovered hope. They realised that it was possible for those with Asperger’s Syndrome to also thrive in life. All they needed was tender, loving, care. Today, there are adults with Asperger’s Syndrome who are successful as professors, lawyers, physicians, artists, authors, educators and even celebrities such as Daryl Hannah, Dan Aykroyd, and singing sensation Susan Boyle who captured everyone’s hearts with her rendition of Les Miserables’ I Dreamed a Dream during her audition for Britain’s Got Talent many years ago. According to the National Institutes of Health, Asperger’s Syndrome is one of a group of developmental brain disorders, which are collectively called autism spectrum disorder or ASD. It’s generally considered to be on the “high functioning” end of the spectrum. The Asperger’s Syndrome page on webmd.com says: “Many children with Asperger’s Syndrome are exceptionally talented or skilled in a particular area. And Patricia’s son, Dennis, is testament to that. Now 31, he’s a graphic design graduate with a passion for art. His drawings and paintings have been exhibited as far as the US. Today, he’s enjoying his second solo outing, with the first one held three years ago at Artemis Art Gallery in Publika, Kuala Lumpur. Specialising in nature landscapes of flora and fauna, his canvas, all 67 of them, in glorious colours, bring to life the otherwise stark white walls of the gallery located on the third floor of the shopping mall. 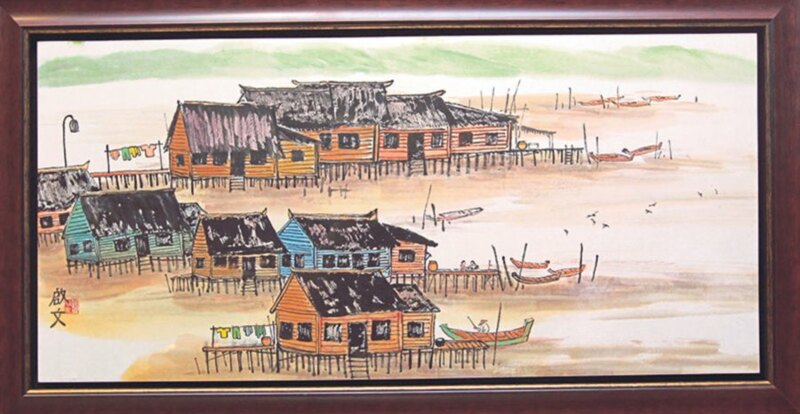 His medium comprise predominantly Chinese ink and water colours on rice paper, acrylic on canvas and oil on canvas. Taking a stroll around the gallery, Dennis happily explains to me that his works — abstract, expressionism, post-impressionism and pointillism (a technique of painting in which small, distinct dots of colour are applied in patterns to form an image) — are inspired by illustrious artists from the past such as Claude Monet, Edouard Manet, Paul Cezanne, Vincent van Gogh, Georges Seurat and Paul Signac, to name a few. Interestingly, according to Asperger’s Association of New England site, there’s strong evidence that Van Gogh himself had Asperger’s Syndrome. “I’m happiest when I paint,” confides Dennis, who’s accompanied by his mother Patricia, as we eventually take our seats at the gallery’s entrance. The passion for art started when Dennis was four. It was a way for him to express his feelings and what he saw through an exceptional photographic memory, a trait often exhibited by those with Asperger’s Syndrome. Proudly, Patricia proceeds to show me some of her son’s earliest works, which she has saved in her laptop. Boats, fighter jets, vehicles, buildings and cartoon characters were the kind of things that Dennis used to draw in the early years. Even back then, it’s obvious that he already possessed an eye for details. 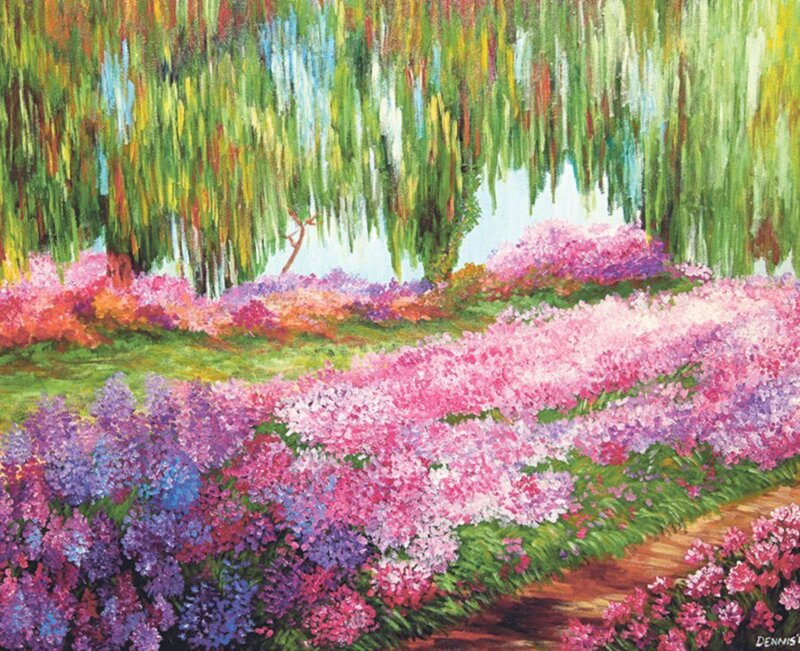 His art journey progressed with nature and landscapes and the use of more vibrant colours, like his painting titled Fancy (Garden) which uses different brush strokes to form the flowers and willowing leaves. 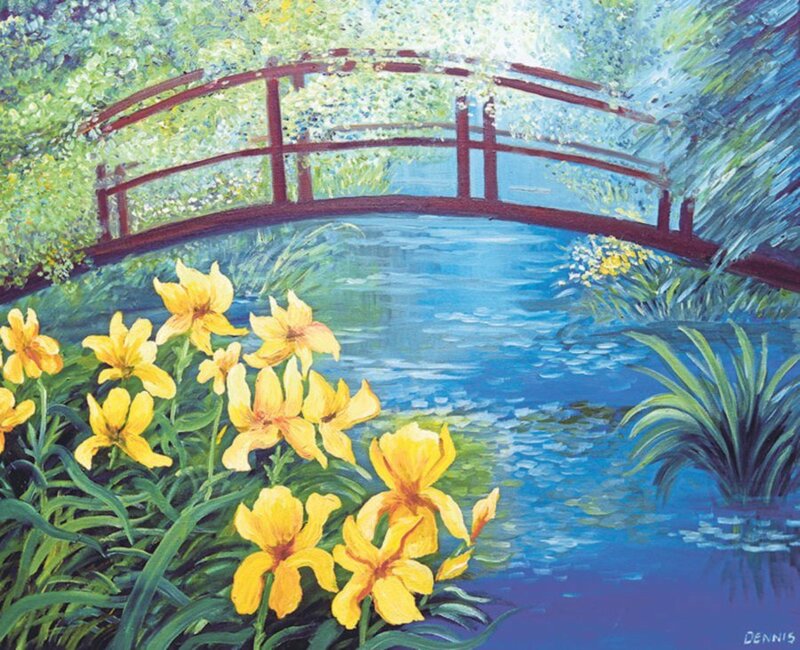 “My favourite painting in this exhibition is the Yellow Irises by the Stream,” confides Dennis, adding that he usually paints at his studio at home in Taman Tun Dr Ismail, Kuala Lumpur, with his biggest fan, his mother, by his side. “I don’t know where he got his talent in art from. I’m not creative at all. None of us in the family is creative except Dennis. I take it as God’s gift to him. And he is God’s gift to me,” confides Patricia, smiling shyly. According to Austism Speaks (www.autismspeaks.org), people with Asperger’s have difficulty with social interactions and often seem expressionless, something that Dennis does mildly exhibit during our conversation. His eyes never meet mine and he doesn’t smile, though he speaks passionately about his life’s journey. It’s apparent that Dennis doesn’t view his condition as a disability; rather, it’s a difference where he’s able to do different things than other people. “But he still needs my guidance from time to time,” chips in Patricia, who shares that she has been persistently teaching and guiding her son since he was small. Her expression earnest, Patricia adds that although her son is knowledgeable and intelligent, there are still some things that he can’t comprehend, such as time management and finances. I turn to Dennis who has been nodding on and off and seems to be oblivious to the conversation that’s taking place in front of him. His mother gently pats his arm to wake him up before continuing with our chat. “I still think there are a lot of things that I have not settled for him. For example, what would happen to him when I’m no longer around?” poses Patricia before admitting that it’s a question that plagues her every day. As for Dennis, he’s surely on his way to achieving his biggest dream — to be a great artist. He knows he’s still not quite there yet but, just like his mother, he’s not intending to give up easily. 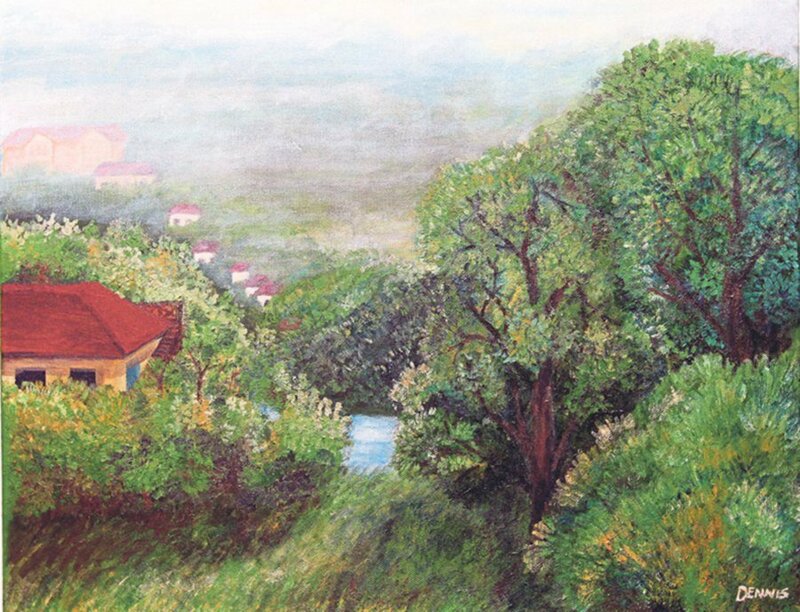 “I’ll paint more and improve myself by joining classes so I can sell more of my paintings. I’ll come up with new ideas. I hope to be as great as our veteran artists such as Syed Ahmad Jamal or Jolly Koh,” he says, eyes dancing. Moving forward, he’s adamant to just let his talent weather whatever storm may arise. “No one is perfect in this world. I’ll just focus on my strengths and forget my weaknesses. Most importantly, I won’t let Asperger’s Syndrome define me,” concludes Dennis, his tone resolute.